When considering the types of dahlia, it is worth remembering that all of today’s variants are descended from an original 30 species. There are now in excess of 57,000 recognised dahlia cultivars worldwide and this number continues to grow through the efforts of gardeners and enthusiasts of this incredible flower. 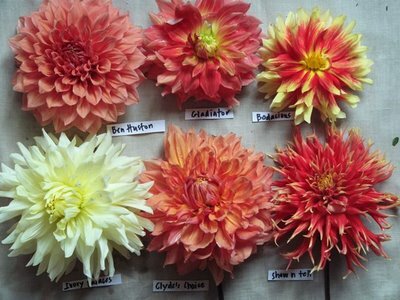 Most people accept that there are 9 distinct types of dahlia which all have clearly defined characteristics. There are also one or two other types of dahlia that are just classified informally as they may have features from various groups. Single – the flower has a central disc with a ring of petals encircling it. The petals may be rounded or pointed. Waterlily – this type has curved, slightly curved or flat petals and is very shallow in depth compared with other dahlias. Collerette – large petals form an outer circle around a central disc. The collar term comes from a smaller circle of much smaller petals closer to the centre. Anemone – The centre comprises of dense elongated tubes. The outer parts have one or more rings of flatter petals. Pompon – These resemble perfect spheres and are made up entirely from petals that are curved inwards. Ball – these are larger than pompons and have a spiral arrangement of incurved petals. Semi-cactus – these have very pointed petals, almost spiky in appearance. Cactus – similar to semi-cactus, but with narrower petals. Decorative – broad petals with no central disc showing. Miscellaneous – orchid and peony types are classified as miscellaneous. © 2011-2012 Dahlias.co.uk, all content copyright. Image copyrights owned by relevant parties (request image removal).